This 2015 photo shows single-track damage to wetlands and meadows on the Northern Calico Trail in the Dolores Ranger District. Photo by Steve Johnson. More than a decade after Forest Service officials began working on a travel-management plan for the sprawling Rico-West Dolores area of the San Juan National Forest, the effort remains mired in controversy and tangled in litigation. In September 2009, the then-ranger of the Dolores District of the forest, Steve Beverlin, approved what was supposed to be the final travel plan for the area while acknowledging how tough it had been to come up with a decision. “The Rico-West Dolores Travel Management Plan has been the most divisive and difficult issue I have dealt with since I became the District Ranger/Field Office Manager for the [DPLO] in August of 2005,” Beverlin wrote in the decision notice for that document. Now, after the writing of another travel plan and years of legal wrangling, the new document has been challenged by both motorized users and environmental groups. On July 31 of this year, the Forest Service issued its final decision authorizing the plan, called the Rico-West Dolores Roads and Trails Project. It sets out rules for travel across nearly a quarter-million acres (244,554) of national forest in Montezuma and Dolores counties. About half of the area is designated as roadless. On Sept. 14, three motorized-use advocacy groups filed a petition in U.S. District Court for the District of Colorado challenging the project, saying that it reduces single-track motorized travel by about 30 percent. “These reductions, unsupported by logic and contrary to law, will create substantial adverse impacts to the human environment and to Plaintiffs, their members, and other Recreationists,” wrote Paul Turcke, attorney for the groups, which are the Trails Preser vation Alliance, San Juan Trail Riders, and Public Access Preser vation Association, all Colorado nonprofits. In their petition, the groups contend that the closed trails “have received environmentally conscious and sustainable motorcycle travel for over 40 years.” The reductions, they say, will concentrate motorized use on remaining routes, remove some key connections between trails, and adversely affect public safety, local economies and access, including to the town of Rico. On Nov. 13, three environmental groups and Dunton Hot Springs, a private resort located within the project area, likewise filed suit against portions of the plan. They argue that it doesn’t go far enough to protect wildlife, water quality, and quiet uses from motorized travel. The various parties may not agree on much, but they do agree on the beauty and special nature of the Rico-West Dolores area. “The Project area is an incredibly varied landscape of mesas with huge expanses of aspen stands, jagged snow-covered peaks, and steep slopes of dense conifers,” wrote the attorneys for Dunton Hot Springs and the environmental groups – the San Juan Citizens Alliance, WildEarth Guardians, and Sheep Mountain Alliance – in their petition to the court. In the past, motor-vehicle travel in national forests was allowed on a policy of “open unless designated closed,” meaning there were many areas where vehicles could travel cross-country. That changed in 2005, when the Forest Service adopted an agency-wide Travel Management Rule that said roads, trails and areas were CLOSED to motorized vehicles unless they were officially designated as open. Motorized users argue that off-highway- vehicles of all types are increasing in popularity, so there should be more, not fewer, routes open for ATVs and dirt bikes. But environmental groups say motorized uses are more damaging than other forms of recreation and need to be managed carefully. “The Forest Service has identified OHV use as a growing threat to National Forests,” the petition from the environmental groups states. 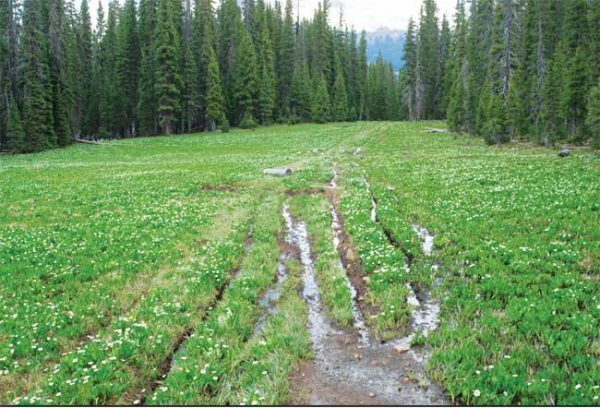 “OHV use adversely impacts the natural environment.” They contend that motorized uses can damage soils, degrade water quality and riparian habitat, harm vegetation and disturb wildlife. The disputing parties had tried to work out compromise solutions to their differences. The Forest Service launched its new travel-management planning effort for the Rico-West Dolores area in 2014. In May 2016, the agency published a draft environmental impact statement for the new plan, and in July 2017 it published a supplemental draft EIS incorporating some changes. The two environmental impact statements offered five management alternatives. Alternative A was the “no action” alternative describing current management. The other four offered varying amounts of motorized use. Alternative A provided the most miles of motorcycle trails (114). E had the least, at 65, and B had the second-least, 86. The alternatives also differed on another key issue – seasonal restrictions on motorcycle travel. A had none. Under Alternative B, the agency’s preferred alternative, trails would be open to motorcycles only from July 1 to Sept. 8. Under the other three alternatives, trails would be open for motorcycle travel from June 1 to Oct. 30. In November 2017, the Forest Service published a draft record of decision and initial final EIS, selecting Alternative B, but with modifications. Under this plan, 83 miles of trail were designated for motorcycle use, and seasonal restrictions only limited motorcycle use on designated trails from June 1 to Oct. 30. Both environmental groups and motorized- use advocates submitted objections to the draft decision, and in February and March the objectors took part in several phone calls designed to resolve the issues. But Forest Service officials felt the process was not going to result in a resolution, and called it to a halt. On April 4, the agency issued a written response to the objections and the reviewing officer supported the preferred alternative (B, with modifications). On July 30, the agency signed its final ROD. The environmental groups charge that the plan will adversely impact elk and their habitat, hunting opportunities, water quality, quiet uses of the forest. They say the seasonal restrictions are inadequate, noting that elk herds are already in decline in Southwest Colorado. The elk rut and mating season, they say, runs from mid-September through mid-October, and most elk calves in Colorado are born from May 15 to June 15. Disruption of the rutting season can result in later spring births, meaning more calves die in the winter because they are smaller and younger. Colorado Parks and Wildlife had recommended closing motorized trails in the area until June 30. In addition, the environmental groups express concern about motorized travel eroding trails and sending dirt into waterways. “The Dolores River is a low-gradient . . . stream that tends to accumulate excess sediment,” they write, adding that the West Dolores River and parts of Bear Creek have a similar problem. The plan authorizes motorized uses on trails adjoining or crossing the headwaters of numerous streams and tributaries, they argue. They say motorized use at the headwaters of Fish Creek and Willow Creek has caused proven damage to water quality and riparian areas. Motorized travel on the North Calico Trail, Spring Creek, East Fork trails is also known to have adversely affected wetlands, they say. They also argue that motorized uses on high-elevation trails can cause deep ruts, making the same trails difficult to navigate for hikers and horses. Mountain bikes leave ruts as well, but they are much smaller, Buickerood said. They are calling for the Forest Service to set aside the Rico-West Dolores project and start over. The environmental groups don’t want the plan to be scrapped, said Buickerood. The environmental groups have filed a separate petition to intervene in support of retaining the Rico-West Dolores plan. It would also continue to allow motorcycle use on the 30 miles of trail that were closed under the plan. He said he remains disappointed that the effort to resolve the conflicts did not work out.